Ubiquinol, one of the body's primary lipid-soluble antioxidants, boosts cellular energy production and provides a wide-range of cardiovascular, cognitive, and metabolic health benefits. Coenzyme Q10 (CoQ10), or ubiquinone, is a lipid-soluble antioxidant found in every cell in the body. CoQ10 is abundant in the mitochondrial membrane and plays an important role in the synthesis of adenosine triphosphate (ATP), a molecule of chemical energy upon which all cellular functions depend. As a coenzyme, CoQ10 is required for several enzymatic reactions required to produce cellular energy and to protect the body against free radicals produced during this process. To maintain energy production, mitochondrial CoQ10 is continuously recycled from ubiquinone, its ATP production state, to ubiquinol, its antioxidant, free radical scavenging state. CoQ10, an essential component of cellular energy production, has been shown to extend cell life and benefit high-energy requiring systems including the cardiovascular, neurological, and immune systems. 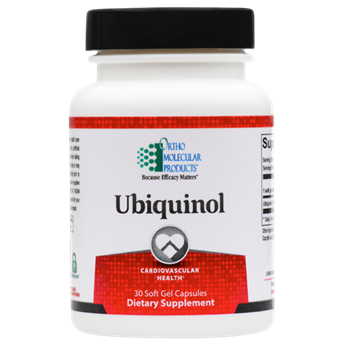 Ubiquinol is the reduced, active antioxidant form of CoQ10. In addition to its critical role in energy production, CoQ10 is one of the most powerful known lipid-soluble antioxidants, protecting cells, organs and tissues from damage caused by oxidative stress and free radicals. For those who cannot efficiently convert ubiquinone to ubiquinol on their own, the patented, lipid-stabilized Ubiquinol formula ensures maximum bioavailability and cell protection.